David Callan (Edward Woodward) used to work for a shadowy section of the British Government, but six months earlier he walked away. Now, his old boss Hunter (Ronald Radd) has called him back. Callan’s currently working in a dead-end job, which he hates. Hunter professes sympathy, but goes on to tell him that “you chaps don’t have much choice when you leave me. I do my best of course, but your talents are so specilised. After all, what can you do? Use a gun, use your fists, open locks. Legally, you’re unskilled”. Hunter wants him back (maybe) – but Callan has misgivings about the work he’ll have to do. This is the driving force behind not only this Armchair Theatre, but the subsequent series. Callan has undoubted skills, but he also has a conscience and it’s this conflict which provides the drama. Hunter goes on to describe the reason for his department’s existence. “What’s my section for? Getting rid of people. Bribery, frame-ups, deportation and death. In the last seven years I’ve had ten people killed, you did two of them. They all had to die Callan. If they hadn’t they would have killed too many innocent people themselves. And that’s what security’s for – protecting innocent people”. There’s a clear distinction between Callan and Hunter’s new right-hand man Meres (Peter Bowles). Meres, like Cross later, is a company man – quite happy to obey Hunter’s orders without question. If Callan doesn’t have all the facts then he’ll always question – and decide on his own course of action. This makes him something of a loose cannon and a clear liability, but his undoubted skills keeps him alive. Hunter wants Schneider (Joseph Furst) killed but he doesn’t explain why. Callan has to do it quickly and without any official assistance – not even a gun. Callan knows Schneider (he works in the office just down the corridor) and he seems a perfectly pleasant man, but for all that Callan dislikes and distrusts Hunter he knows that there’s a reason why Schneider has been placed in a red file (Hunter’s system for people who demand “special” treatment). After burgling Schneider’s flat, Callan finally understands why Hunter wants him dead – Schneider is a gun-runner, indirectly responsible for the deaths of a number of British soldiers. Callan therefore accepts that he should die and asks his smelly friend Lonely (Russell Hunter) to get him a special gun – a Magnum, like the ones that Schneider imports. The relationship between Callan and Lonely would be one of the joys of the series – although here it’s a very hard-edged one. Callan makes the usual jibes about Lonely’s lack of personal hygiene, but there’s little of the good humour that the pair would share later. One irony of the story is that Callan later becomes reluctant to kill Schneider because he’s got to know and like him (even though he’s aware of the blood on his hands). If Hunter had given him all the information to begin with, he probably would have carried out the mission much earlier. Callan arranged with Hunter that he would kill Schneider by 11.00 pm, Hunter then arranged to have the police call shortly after that. Could Callan have shot Schneider in cold blood? The question didn’t arise, because Meres had broken into the flat (ready to kill Schneider, if Callan wasn’t able). When Schneider pulled a gun on Meres, Callan was able to do the deed. Callan’s well aware that Hunter had double-crossed him. If he’d killed Schneider by 11.00 pm, then he would have been caught red-handed. So he exits the flat, leaving an unconscious Meres and the murder weapon behind. After informing Hunter that he really doesn’t want to work for him, Hunter places Callan’s details into a red file. Initially a one-off for Armchair Theatre, James Mitchell saw the obvious potential and Callan would run for four successful series during the late 1960’s and early 1970’s. Even here, most of the parts are in place. 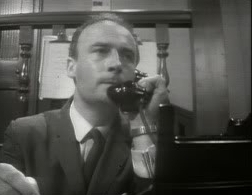 Edward Woodward was, of course, perfect as Callan – a man with scruples in a business where that’s a positive liability. Ronald Radd was the first (and in many ways) the best Hunter – unscrupulous, amoral and totally untrustworthy – although there’s sometimes the odd spark of understanding between him and Callan. As I’ve said, Lonely is not yet the confidant of Callan that he would become – but Russell Hunter does a great deal with a small role and it could be that the character was developed once Mitchell knew what Russell Hunter could deliver. Meres would be a regular in the series, but he would be played by Anthony Valentine and not Peter Bowles. Here, Callan and Meres barely exchange more than a few words – but their relationship would develop during the first two series. Initially rivals, they would grow to understand and appreciate each other. Whilst Peter Bowles is a great actor, I think that having Anthony Valentine as a regular was something that really benefited the series. His brand of suave brutality contrasts well with the more down-to-earth nature of Callan. It’s a shame that the archive retention of the first two series isn’t greater (two of the six stories from series one exist, nine of the fifteen from series two) but since other programmes fare even worse, we’ve a decent cross-section of stories from the B&W era, which I’ll be reviewing in the weeks to come.